“The John Amico School of Hair Design has endeavored to produce quality cosmetologists who can meet the present and future demands of the beauty industry. The John Amico School of Hair Design is student-focused and committed to providing each student the knowledge, training, and confidence needed to succeed in the cosmetology profession. Throughout their training programs, emphasis is placed upon essential salon services and techniques, business strategies such as customer service, client retention, salon retailing, target marketing and people skills. With a mother who was an artist and a father who was an architect, John Amico Sr. was destined for a creative career. After attending Notre Dame to pursue an architecture degree, he switched to beauty school. Amico’s determination to succeed came after initial failure. He was fired from his first two salon positions after only days. He started over as a shampoo boy and within six months was as good a hairstylist as anyone he worked with. After one year a client offered him a lease on an empty barbershop next to his business, and John took advantage of this opportunity. And opened his first salon. He spent the next four years training, traveling and competing as a platform hair artist. His specialty was competitive hair design and creative haircolor with European influences, after studying in London, Brighton, Paris and Amsterdam with world champion hairstylists. When asked what led to his initial success Amico states, “Not knowing any better!” Amico was always entrepreneurial growing up, starting many small businesses. He says, “If you have a dream, you have a vision. A lot of people out there are dream-killers. You have to be able to see what others cannot see.” He initially opened a chain of his own cosmetology schools. Then, he launched “Hair Performers,” as a salon chain in 1973, seeing a need for trendier and younger image full-service hairstyling salons. He manned the businesses with students from his beauty schools and in 1976 had grown to 20 locations. He helped students and staff purchases his branded salon system of their own, telling them, “we’re going to hire you as a future owner.” This very successful salon chain grew to 225 locations. Amico is a regular motivational speaker, at events such as Intercoiffure, Premiere, the Midwest Beauty Show and the International Beauty Shows as well as events such as the Subway International Franchise Convention. . Amico won the prestigious ‘Sprit of Life Award’ in 1986, joining the ranks of such industry leaders as Jheri Redding and Paula Kent-Meehan of Redken, Arnie Miller of Matrix, John Paul Mitchell and Mike Renzulli of Sally’s Beauty Supply. He also works to support local charities. Family remains a major part of his life and he talks to his children every day. If you were a roommate of John Amico, Jr. during his college days, you could get a beer and a haircut for $5 on Friday afternoons in his dormitory. Amico had already decided to make a career in the hair industry at an early age, having grown up in the business with father John Amico, Sr. He worked in his father’s salons as a child, selling Christmas ornaments, sweeping up hair, stocking retail shelves and doing a variety of odd jobs. While in high school, he attended cosmetology school and he then attended Bradley College in Peoria, IL for his undergraduate degree in Marketing. Being actively involved in his father’s business at an early age gave Amico Jr. a head start. By the time he got to college, he understood how his business knowledge would apply to the industry he intended to join. He received the ‘Marketing Student of the Year Award’ while at Bradley, which came with a scholarship from Proctor & Gamble. He later earned an MBA in Finance from DePaul University. 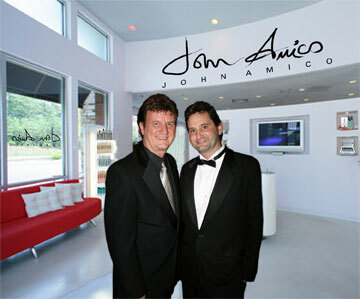 In 1989, Amico Jr. started his full-time career in the professional salon business. He worked at his father’s new salon business “Hair Performers” for one year, taking it from zero profit to a high performing salon, reaching $11,140 in sales during their top week. Amico learned early on how to be a successful leader in his field, through the influence of his father as well as his own experiences. His father taught him perseverance, hard work and the importance of always giving something back to others. “My father is the most persevering person I know,” says Amico Jr. If there’s a brick wall and only one way over, under, or through it, he’ll do it. He’ll make the impossible — possible.” Amico Jr. then became Director of Operations for his father’s national “We Care Hair” salon chain franchise, working on store designs, training and lease negotiations. He quickly learned one of his first business lessons from Fred DeLuca, founder of Subway Sandwiches and co-owner of “We Care Hair” with John Amico, Sr.. Fred was a role model and mentor to John Jr. Amico credits other great entrepreneurs for inspiring him as well, especially early industrialists like Marshall Fields, Dale Carnegie and Henry Ford. John Amico Jr. continued to work with his father in their cosmetology schools and salons until they were sold in the 1990’s, shifting focus to the John Amico Product Company and education. Amico focuses on ensuring that new students and salon owners are successful through the many educational opportunities. Amico says he likes to “talk about the moo,” which is being positive and motivated. He posts a motivational message on a board for his staff every night. One of his personal favorites “Life is a journey, not a destination,” stressing development and learning along the way in order to achieve any personal or business goal.